Okay, now I've officially visited every location of Burgoo. I wasn't really planning on eating at the Main Street location today; but when I asked my son what he wanted to eat, he emphatically proclaimed "grilled cheese!" 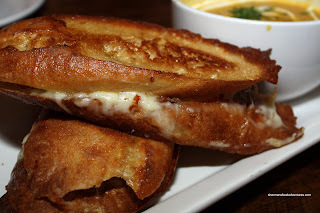 Of course, we were not intending to eat grilled cheese in any form. In fact, we were on our way for some noodles (another favourite of his). This was roughly a block away, so I immediately had to take a left onto 15th Ave. The last time we tried to eat at this location, there was an hour wait despite being only 5:00pm. We were lucky today as we got seated right away. I noticed that they have added an "extension" to the front of the restaurant. The extension is merely a tented area with heaters. No matter, the place is so darn small, it's necessary. It'll probably be outdoor seating in the summer. Unlike some other restaurants of the ilk, Burgoo is relatively family friendly with high chairs and crayons. Sure, it's a bit dark and cramped; but it works. 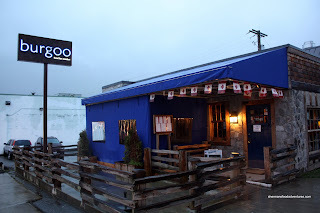 Compare it to a popular chain restaurant such as Earl's, at the very least, Burgoo tries to accommodate families. So... the whole point we were here was due to the "grilled cheese" and of course we order ed it. For $2.00 more, you can make it a soup and sandwich combo. In my opinion, this is worth it (assuming you like soup, but why would you come to Burgoo if you didn't?) since it is a fairly large bowl of soup. So we ultimately got the Gooey Cheese Grillers with Sunset Corn and Chicken Soup. I've tried the corn and chicken soup at the Pt. Grey location before; but Viv hadn't. She really liked it since there were many flavours at work. 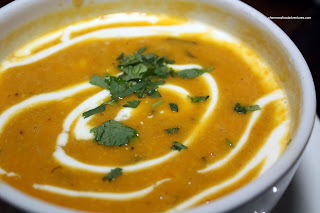 She thought the chipotle and cumin almost made the soup taste a bit curry-like which worked well with the sweet corn and crema fresca (which is quite similar to creme fraiche). Compared to the cheese grillers from the North Vancouver location, these ones were less fried. Still crispy, the bread was not completely doused in oil; thus there was some bread-like qualities left. Again, the cheese was ooey and gooey. This time around, I went for the Lamb Tagine which is served in a traditional tagine slaoui. 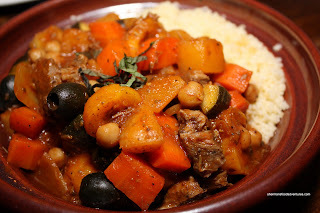 Served with couscous, the stew consists of lamb, apricots, olives, carrots, chickpeas, celery, onions, zucchini and turnips. The stew itself was not to o gamy since there was actually very few pieces of lamb. Furthermore, the apricots and carrots added a sweetness to the dish. 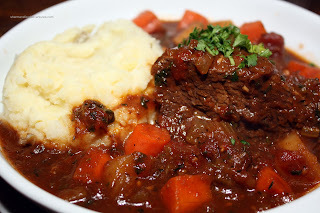 Viv had the Pot Roast served with mashed potatoes. With the same root vegetables as my dish, the pot roast was a bit stringy. Much like my dish, it was on the sweeter side which was pleasant. This was an "okay" pot roast. Another solid meal at Burgoo once again. However, after 3 visits, I've noticed that there is not really that much meat in their stews. Not a huge problem if you are having a sandwich or soup; but since they are known for their stews... they might want to add a bit more meat.